Your computer screen looks like it’s afflicted with measles. A sprinkling of red dots cover a map of Orange County. 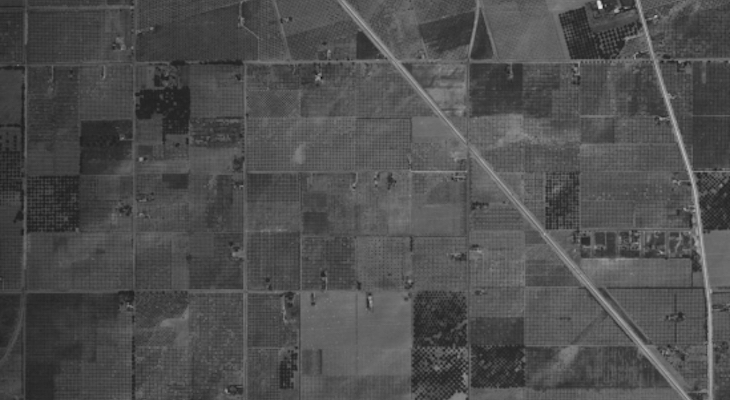 Click on one of the dots and it’ll lead you to a black-and-white photo from 1930 of a vast, vaguely familiar landscape of what appears to be citrus orchards laid out in a nearly perfect grid. Click on another dot and up pops a similar photo, this one from April 1960. Housing tracks have mostly replaced the orchards and a freeway runs diagonally through the picture. But there’s something else different, a weird oblong shape in the middle. Zoom in and the unmistakable mosaic of Disneyland comes into view. There’s Tomorrowland next to the Matterhorn. To the west is Frontierland, at the bottom right, Adventureland. With another click you navigate 407 miles north and 89 years into the past. It’s San Francisco just a generation after the great fire of 1906, and in the lower right are a series of piers. Today the land just west of them is the site of Oracle Park, home of the San Francisco Giants. Not a Giants fan? Click again and you’re 380 miles south in 1931. The nondescript open space is Chavez Ravine. In 31 years Dodger Stadium will open on that land with the Los Angeles Dodgers losing to the Cincinnati Reds, 6-2. Welcome to what Jablonski calls “the Google Earth time machine.” A vast repository of 2.5 million aerial photos, the collection is the largest in the world. Spanning from 1924 to 2010, the stockpile literally has California covered; about 90 percent of the collection is dedicated to the state. And much of it is available to the public with the click of a mouse. More than 400,000 of the collection’s photos can be accessed through FrameFinder, an interactive database that allows you to search through time as well as geography. Photos that are already digitized can be downloaded free; the rest can be scanned for $20 each, plus a $10 processing fee to the entire order. A complete fee schedule is available here. The photos, taken over the decades by dozens of aerial survey firms, were used primarily to make topographic maps, determine property lines, do land-use planning and more. Planes with large-format cameras generally flew north and south in a grid to create a high-resolution record of the area. More than 99 percent of the photos provide a vertical, or straight down perspective; about 70,000 are oblique, bird’s-eye views, Jablonski said. And, since many of the vertical photos overlap, the digital images can be seen through virtual reality headsets in the library’s Interdisciplinary Research Collaboratory. Analong images with 60 percent overlap can be viewed with a stereoscope, available in the library’s Special Research Collections for a 3-dimensional effect. For questions about the collection, email special@library.ucsb.edu or call (805) 893-3062 or (805) 893-2779. Today, as in the past, the main users of the aerial photo collections are developers, land-use officials, geologists and others whose living depends on accurate geographical imagery. “All the local geologists know about this. All the local land-use planners and the guys at the county know about this,” said Jablonski, who noted its photos are frequently used to settle property line disputes. In an age when a lifetime of pictures can be saved on an external hard drive, 2.5 million photos might not seem like much. But when they’re large negatives and prints — many 9 by 9 inches — they require an extraordinary amount of space. The aerial photo collection is stored in at least three rooms in the library. Some of the most fragile film is stored in four refrigerators on Ward Drive just off campus. The library has upwards of 60,000 images stored in a high-tech vault near Magic Mountain that holds film and television archives on extremely flammable nitrate film. The images are stored in refrigerators because of what’s known as “the vinegar syndrome.” As the acetate film breaks down it releases acetic acid and begins to smell like vinegar. Unfortunately, the aroma is a death sentence for the film because the deterioration can’t be reversed — only slowed by low temperatures. Which means Jablonski is in a race to get the film digitized as quickly as possible. Jablonski estimates he can keep the more modern film relatively stable for 50 to 75 years — about as long as it’ll take to scan everything. It’s an ambitious undertaking, he acknowledged, but a necessary one. Besides, the collection is more than a bunch of photos, he said. It’s a treasure trove of time and space, a record of a state always in motion, ever changing. I spent a couple hours on it last night. Was surprised to when things were built or what used to be there. Thank you so much. And edhat subscription paid off as well for the tip! This is an awesome collection, thank you for sharing the information on how to access it. I was able to download a photo of my neighborhood and house from the 50's! A truly fantastic collection even half a century ago when I fist discovered it. So much more data now and soooo much more accessible. Like Google Earth on steroids and optimized for research. Go, go , go!